NRG Stadium in Houston, TX was the site of Super Bowl 51. New IT-based technologies have been adopted more readily and sooner in some parts of the broadcast production chain than others. Super Bowl LI illustrated that with the intercom and general communications operation taking place almost completely in the IP domain, using a combination of Dante running over RTS’ OMNEO platform, while audio distribution and networking continued to rely on older formats such as MADI. Last time FOX Sports was host broadcaster for the event - Super Bowl XLVIII in 2013 between the Denver Broncos and the Seattle Seahawks at the MetLife Stadium in New Jersey - IP was a relatively small part of the intercom connection, with MADI (multi-channel audio digital interface) linking between the OB trucks. "There were a few problems but it wasn't too bad," comments Andy Rostron, who headed up the comms team with Mike Gilman for both events. This time round the technology had matured to the point where Rostron and Gilman were confident to use it for practically the entire intercom set-up. As Rostron observes, OB trucks in the US are almost exclusively equipped with RTS comms systems and this held true for the vehicles supplied for Super Bowl LI in Houston by Game Creek Video and NEP. The trucks in the TV compound at the NRG Stadium and in the Downtown district of Discovery Green housed RTS ADAM digital matrix systems, connected over the manufacturer's OMNEO media networking platform. OMNEO is a multi-channel system comprising two main components: a transport carrier based on Audinate's Dante IP technology; and a control element using Open Control Architecture (OCA). 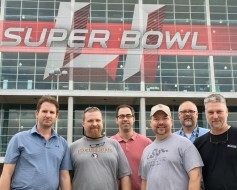 Rostron works on weekly coverage of big national football, which are enough of an undertaking in themselves, but says the Super Bowl calls for a more extensive comms infrastructure: "We expanded one of the frames at the stadium to add more capacity. This is because of the additional editing areas and office trailers for the producers. It all makes for a gigantic set-up that has to be tied together." This involved vehicles in the TV compound at the stadium, including the main production centre based round Game Creek's Encore interconnected trucks, the studio presentation control room in the Peacock unit (renamed Cleatus for this Super Bowl) and NEP's Denali working on the Half-Time Show. All vehicles in the compound were connected over CAT6 due to their proximity. The comms network stretched beyond there to NEP's ND1 trucks at Discovery Green and then on to FOX Sports' headquarters in Los Angeles and its Network Centre in Charlotte, North Carolina. The overall comms network involved 2500 ports of intercom, with six RTS OMI 64 OMNEO matrix cards; 300 KP series key panels, which Rostron says are now all OMNEO compatible; and 125 trunks between all the trucks. Within the overall IP world there was a mixture of audio over IP (AoIP) and voice over IP (VoIP) technologies. To interconnect the two there were 40 channels of RTS RVON VoIP interfaces between Houston and LA and Discovery Green to Charlotte. NEP ND1, with its A, B and C units, featured 56-channels of RVON as well as OMI 64 devices. There were also 40 TIF phone dial-ups/IFBs (interruptible foldbacks) available on intercom keys. Mike Gilman, chief technology officer of Bosch/RTS dealer and installer Gilman Technologies, explains that AoIP and VoIP were used in different situations according to the amount of delay that could be tolerated on a connection. "Where we couldn't guarantee less than 1 millisecond latency we went with RVON," he says. "There were only a dozen cases like that but otherwise we used Dante throughout." Racks for RF equipment supplied by Soundtronics Wireless. Rostron comments that the size of the production, with so many people on key panels and belt-packs was "pretty challenging". The challenge was made all the more daunting by the need to 'swing' between cameras and facilities for the different facets of the production; from the pre-game to the red carpet to the game itself to the Half-Time Show and back again. Commenting on that last transition, FOX Sports' audio consultant Fred Aldous, who mixed the game, says, "We shared several cameras with the Half-Time crew in Denali, so comms were important to swing between game coverage and entertainment coverage. That can be a challenge considering several cameras were shared between the game crew, studio show, red carpet show and entertainment." Clearly everything worked out because Aldous exclaims, "My comms guys rock!" Communications for the kick-off and the pre and post game presentation and the Half-Time Show involved wireless technology. This was supplied by Soundtronics Wireless of Las Vegas and revolved round a Clear-Com Eclipse Omega matrix with 25 FreeSpeak belt packs running in the 1.9GHz band and four CC V-Series push panels. "The matrix was also used to feed eight wireless IFBs via Shure PSM 1000 transmitters," comments Jason Waufle, RF and comms technician and a partner at Soundtronics. "The entire system ran using Dante over fibre networking, using Focusrite Rednet 4 mic preamp/line input units and a Rednet D64 MADI-Dante bridge to convert signals when needed." Soundtronics also provided two Telex BTR 800 UHF base stations and its proprietary Phoenix Antenna distribution system. Lady Gaga began her Super Bowl LI exposure by singing the National Anthem at the start of the game. At half-time, all eyes were on her spectacular entrance from the stadium's roof top, continuing with an eye-popping performance extravaganza of some of her most famous songs. Andy Rostron comments that working with an IP-based intercom put everyone through "a bit of learning curve" but it did straighten out the business of network. "If you've got a network [established] then it will work," he says. "The thing with Dante is that once it is set up then everything is routable on-screen. We also went straight from the [main] intercom to the talkback system on the Calrec desks in the trucks through the Hydra network using two Dante cards. It created a direct path." There are still fundamental issues to consider, Rostron concludes, including compatibility with switching systems and timing. But, overall, he sees AoIP, and one format in particular, as the future: "Dante is going to revolutionise communications. It makes it so much easier and going non-Dante is going to be painful."